While enjoying the sun after a cool dip in the Olympic-sized pool of Koufonisia Hotel, treat yourself to some fruit juices, coffees, and snacks prepared at the pool bar. Enhance those hours of relaxation under the sun with your favorite refreshments. 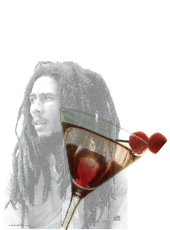 As for the evening, Koufonisia hotel has its own meeting place called Marley's Bar. The reggae rhythmns, the casual décor, and your favourite cocktail will make you feel that Marley’s Bar is the best place to be on a summer night on Upper Koufonissi.